Lineup of the Explosive Residue with the photos. The above graphic was broadcast on CNN and made available on their website (briefly) illustrating those seats that were recovered with traces of PETN residue, later dismissed as the remains of a bomb detection exercise, it should be noted that the explosive residue is in the same area where a strange red residue consistent with the combustion byproducts of an aluminum / ammonium perchlorate solid fuel rocket motor was found. ITEM 2: The photo of the starboard side of the reconstructed aircraft. This is the photograph released by the NTSB of the starboard side of the reconstruction of flight 800. Note the large circular hole at the very right, through the center of which ran the main decking, and note the severe scraping in the paint indicating high speed contact with a hard object from the outside. ITEM 3: PUTTING IT ALL TOGETHER. In this image, we have rotated the CNN graphic 180 degrees and scaled both images to line them up, using the R2 and R3 hatches as our reference points. Note that the forward edge of the area where explosive residue was found lines up exactly with the circular hole punched through the side of the 747! That the entrance hole is related to the explosive residue is clear. The above lineup suggests that, contrary to the theory of a warheadless test missile, a test missile with an explosive warhead punched through the plane's starboard side, possibly at a shallow angle headed towards the apparent exit hole near the portside wing. Following the explosive decompression of the cabin, residual smoke was blown backwards from the original hole to the steadily widening cracks as the nose section started to fall away, contaminating additional rows of seats aft of the strike point. This is the story, still at HTTP://cnn.com/US/9608/23/twa.update/index.html which accompanies the graphic used above. wreckage of the passenger cabin. comment on a similar report in The New York Times. of the forward passenger cabin between rows 15 and 25, a source told CNN. mechanical failure. "We need more evidence," he said. Additional Stories About The Seats. What happened behind row 23? SMITHTOWN, New York (CNN) -- Additional traces of explosive residue have been found in the wreckage of TWA Flight 800, federal investigators said Friday, but that does not prove the July 17 crash was caused by a bomb. A source close to the investigation told CNN the residue came from the same explosive detected in laboratory tests on microscopic evidence last week, but was found in a different part of the plane, making it difficult to draw a pattern. The source didn't say where the recent residue was detected. Law enforcement sources said the earlier trace evidence was residue from PETN, a chemical ingredient of plastique or plastic explosives. Those traces of PETN were found between rows 15 and 25 on the right side of the passenger cabin. FBI and National Transportation Safety Board investigators said in a joint statement Friday: "Based on all of the scientific and forensic evidence analyzed to date, we still cannot conclude that TWA Flight 800 crashed as the result of an explosive device." They said evidence of "physical damage or patterns characteristic of a detonation" still must be found before they can say with certainty that a bomb or missile brought down the Boeing 747 bound from New York to Paris. Missing seats Two rows of missing seats from the center of the jumbo jet could help pinpoint the location of the explosion that brought down the plane off New York's Long Island, killing all 230 people on board. As recovery efforts in the Atlantic Ocean continue, rows 24 and 25 on the right side of the Boeing 747 are still missing, a source who has seen wreckage recovered so far told CNN. The missing rows are located just a few feet behind the front edge of the right wing, where the wreckage shows the greatest amount of fire damage. 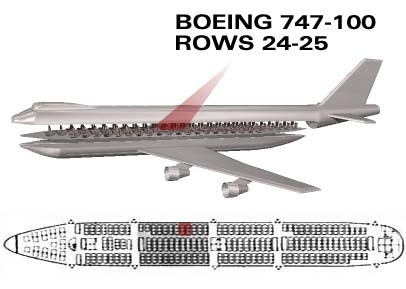 In rebuilding the jumbo jet in hopes of finding the cause of the crash, investigators have been concentrating on the midsection, from rows 17 to 28. Referring to the seats in those 12 rows, Robert Francis, vice chairman of the NTSB, said Thursday they were more heavily damaged than other parts of the plane. Two seats on the farthest right side of row 23 had fist-sized holes punched into their sheet metal back supports, sources told CNN Friday. Row 23 is directly in front of the missing rows. Computer simulation Investigators are working with a computer simulation to try to recreate what happened when the plane was blown apart shortly after takeoff from New York's John F. Kennedy International Airport, an NTSB official confirmed. Such a simulation is standard in most crash investigations. However, the official said the computer results have not yet led to any conclusions about the specific location of the explosion. "We have not zeroed in on any passenger seat. It's not that specific," the NTSB official said. Officials still say they lack sufficient evidence to say with any certainty whether the plane was brought down by a bomb, a missile or some mechanical catastrophe. Divers have found and recovered at least 65 percent of the jet but "there's a lot of the center fuel tank that's missing," Francis said. Investigators are anxious to find more of the tank because they know an explosion took place there. Francis said salvage work for the remainder of the wreckage could be shut down this weekend if Hurricane Edouard heads north toward the crash site. SMITHTOWN, New York (CNN) -- Investigators have found traces of the chemical RDX in the wreckage of TWA Flight 800, CNN has learned. The substance was one of the ingredients in the deadly bomb that exploded aboard Pan Am Flight 103 over Lockerbie, Scotland. Investigators admitted Friday that they had found traces of a second chemical on pieces of wreckage from the July 17 TWA crash, but wouldn't say what the substance was or where it was found. But two sources close to the probe told CNN it was RDX. RDX and PETN -- traces of the latter were found on TWA debris earlier this month -- combine to make Semtex, the explosive used in the Pan Am crash in 1988 that killed 270 people. That crash was blamed on terrorists. FBI scientists found the trace of PETN on a section of flooring from the center of the TWA Boeing 747 jetliner. According to one source, the RDX was found on a curtain used in the cargo compartment of the jumbo jet. This source said the curtain was thought to have come from a cargo hold at the rear of the plane. Officially, the cause of the explosion aboard TWA 800 remains undetermined and the FBI says its latest trace findings are not enough to declare the crash a case of sabotage. FBI and National Transportation Safety Board officials said in a joint statement Friday: "Based on all of the scientific and forensic evidence analyzed to date, we still cannot conclude that TWA Flight 800 crashed as the result of an explosive device." The investigators said evidence of "physical damage or patterns characteristic of a detonation" still must be found before they can say with certainty that a bomb or missile brought down the flight. 'Striking damage' A safety board official told CNN Friday that investigators found "striking damage" to two seats in Row 23 on the right side of the plane; the two rows behind them -- 24 and 25 -- were missing. The row 26 seats were found. "There's no question that's interesting, but it does not get us to the end game," a federal investigator said. A separate source identified the damaged seats as Nos. 9 and 10, the far right seats nearest the wing and over the center fuel tank. He described the damage as fist-sized holes in the steel-plated back supports. "There are holes in those seats," the source said. But, "there is no conclusion to be drawn from that evidence at this time." 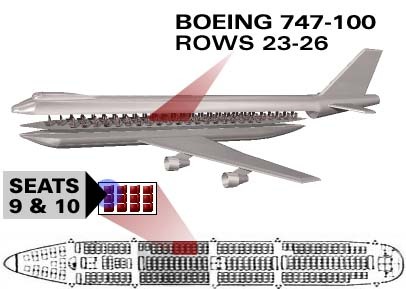 Families questioned The FBI has begun questioning families of passengers who were assigned seats in the missing rows 24 and 25. Authorities want to know more about the background of those victims, where they may have traveled overseas in the past, and who their friends and associates were. Rows 23-26 were located just a few feet behind the front edge of the right wing, where the wreckage shows the greatest amount of fire damage. The FBI tries to explain. As has now been revealed in a lawsuit against Vice President Al Gore, the government changed it's claims from terrorist bombing to "mechanical fault" coincident with a large donation to the Democratic National Committee by the airliners, which sought to avoid the high costs of implementing the anti-terrorist programs suggested by President Clinton in the wake of the TWA 800 crash. Of course, those programs would never have saved TWA 800, as terrorism was never the cause. The following story was issued (note the date just two months before the election) to explain away the previous reports of detected explosives. NEW! It has recently been reported that the bomb exercise actually took place on a different aircraft altogether from the TWA 800 aircraft. NEW YORK (CNN) -- As part of a training exercise, law enforcement authorities carried packaged explosives aboard the TWA Boeing 747 that burst into flames off Long Island two months ago, the FBI confirmed Friday. Several packages of explosives were used to train bomb-sniffing dogs in St. Louis six weeks before the July 17 crash of TWA Flight 800; all the materials were removed after the training session, agents said. The Federal Aviation Administration and the St. Louis police were involved in the exercise. The fact that the packages were aboard the jet may explain the traces of explosives investigators found in the wreckage, the FBI said. Federal investigators found traces of two chemicals, PETN and RDX, on some pieces retrieved from the floor of the Atlantic Ocean. Investigators, who requested anonymity, insisted to CNN that the training exercise had nothing to do with the explosion. Sources tell CNN the test packages contained a variety of explosive components, including plastique and TNT. If tests show that the explosives carried onto the plane match the residue on the wreckage, it could bring investigators back to the starting gate in their search for a cause. On Thursday, the National Transportation Safety Board said that because of the absence of conclusive physical evidence pointing to a bomb, they planned new tests to determine if a mechanical malfunction was responsible for the explosion. An FAA official told CNN that in-service airplanes are routinely used to train and test bomb-sniffing dogs, and actual bombs are "occasionally" brought on board as part of these drills. WHY THE 'DOG' THEORY DOESN'T WORK. Targets used to train bomb dogs are small packages well hidden. Residue from such an exercise would be found in a seat back, a closet, or a cabinet, not in a continuous swath of explosive residue contaminating 10 whole rows of seats. PETN, or Pentaerythritol Tetranitrate (C5H8 N4O12), is a high brissive explosive used in blasting caps and fission implosion devices. There is also a detonation cord made with PETN and even a brand of "squibs" used in Hollywood live-action special effects. Like Nitro-glycerine, when combined with a lactose inhibitor it is useful in the treatment of angina pectoris, a heart ailment. PETN is similar is properties to TNT, HMX, OCTOL (a TNT and HMX blend), RDX, RDX COMPOSITION B, RDX COMPOSITION B3, 75/25 CYCLOTOL, BRA, TETRYL, PBX 9007, PBX 9010, PBX9011, PBX 9404, PBX 9407, LX-04, and LX-07. As such, PETN is commonly found in both nuclear and non-nuclear missile warheads. Back To The Crash Page. Back To The TWA Page.